Making gingerbread in the days leading towards Christmas was never a tradition in my family. We didn’t build houses dripping with sweets or stamp out the imprints of men and press sultana buttons into their chests. I more closely associate festive baking with trays upon trays of mince pies, many of which would make their way into the freezer for a warming homemade batch at a moment’s notice. Or perhaps my Granny’s Christmas cake, where my sister and I would separate the fondant from the marzipan as in our minds the latter was the devil. Of course, the sweet treat I look forward to the most is my Mam’s clootie dumpling, a piece of fabric dusted in flour and a sweet spiced fruity mix tied inside and steamed for hours. I don’t think anything, even pigs in blankets, sprouts or chocolate coins spell Christmas the way a spoonful of dumpling, a swig of flaming brandy and a dollop of custard does for me. 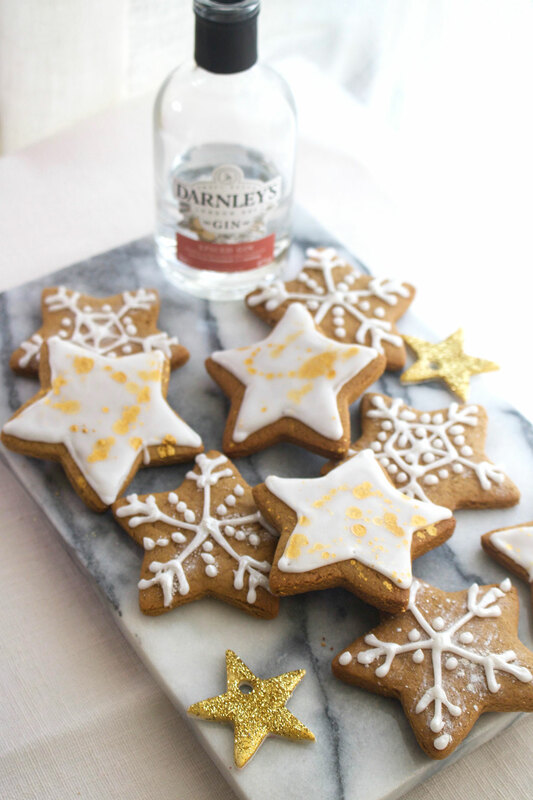 Therefore the decision to make a batch of gingerbread biscuits was not steeped in any memory or sense of nostalgia, but rather a bottle of gin that landed on my desk from Darnley’s, along with a gingerbread spice mix with plenty of juniper and a star cutter. I suddenly envisioned that, once our tree had been put up in the flat to the tune of a Christmas movie, the kitchen would fill with the scent of gingerbread and puffs of icing sugar as I piped intricate snowflakes and splattered gold shimmer onto iced stars. Yet each year, I forget that Christmas isn’t a cookie cutter scene from a movie. Gifts are bought in a rush, sellotape forgotten on the shopping list yet again. Parties and drinks seem to come out of nowhere after a slow November, and there is panic trying to see everyone with a smile when there are Amazon orders piling up. Naturally there are a fair few arguments about ornament placement, control of the television remote and just utter festive fatigue. It’s almost nice in a way to be reminded that the perfect Christmas does not exist, and to stop being so stressed. 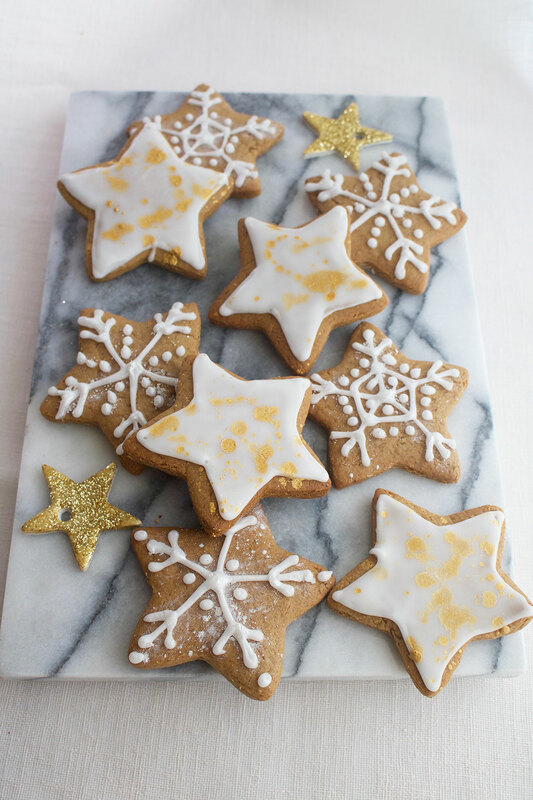 And so in that spirit, that is how I came to make these gingerbread stars and snowflakes. Not in my perfect scenario, but instead in silence. Pieces of our faux Christmas tree lay unsorted on the floor by the window and decorations halfheartedly searched through. In my pyjamas, I rolled the dough whilst listening to a true crime podcast as my boyfriend tapped away on his laptop without a carol to be heard. Piping and flooding biscuits, dusting with glitter and splattering with gold, I finished them at 11pm and went straight to bed. The next evening, as we put up our tree in higher spirits with new baubles and playing A Christmas Carol in the background, these biscuits became the perfect treat to nibble on as we worked away. And in that moment, the start of my Christmas felt perfectly imperfect, just the way I like it. Darnley’s Gin sent me a bag of this lovely spice mix to use in some festive baking. To make your own, combine 1 and ½ tsp ground ginger, ½ tsp ground cinnamon, ½ tsp ground cloves, ½ tsp ground coriander, ½ tsp ground cumin, ½ tsp ground mace and 6 juniper berries. Pulse in a spice blender or use a pestle and mortar until the mix is smooth. Use the entire quantity in the below recipe or 4 tsp if making a double or triple batch. Place the golden syrup, butter and sugar in a saucepan and stir over a medium heat. Once melted together, cool the mixture for 3 to 4 minutes. Meanwhile whisk together the spice mix, bicarbonate of soda and flour in a bowl. Pour the sugary buttery mix into the bowl and add the egg, stirring to a sticky dough. Wrap tightly in clingfilm and place in the fridge for at least 30 minutes before using. Preheat the oven to 200oc/180oc fan and line two large baking trays with baking parchment. Flour a clean work surface and cut the dough in half (this makes it easier to roll). Sprinkle the dough and a rolling pin with flour and roll to the thickness of a pound coin. Using a star cutter, cut as many shapes as possible from the dough, rerolling the scraps and then using the second half of the dough. Space the stars well apart on the tray and place in the oven to bake for 12 minutes. Remove from the oven once golden and cool for a few minutes on the tray before transferring to a wire rack to cool completely. Repeat with the remaining stars. Once the biscuits have cooled, make the icing. 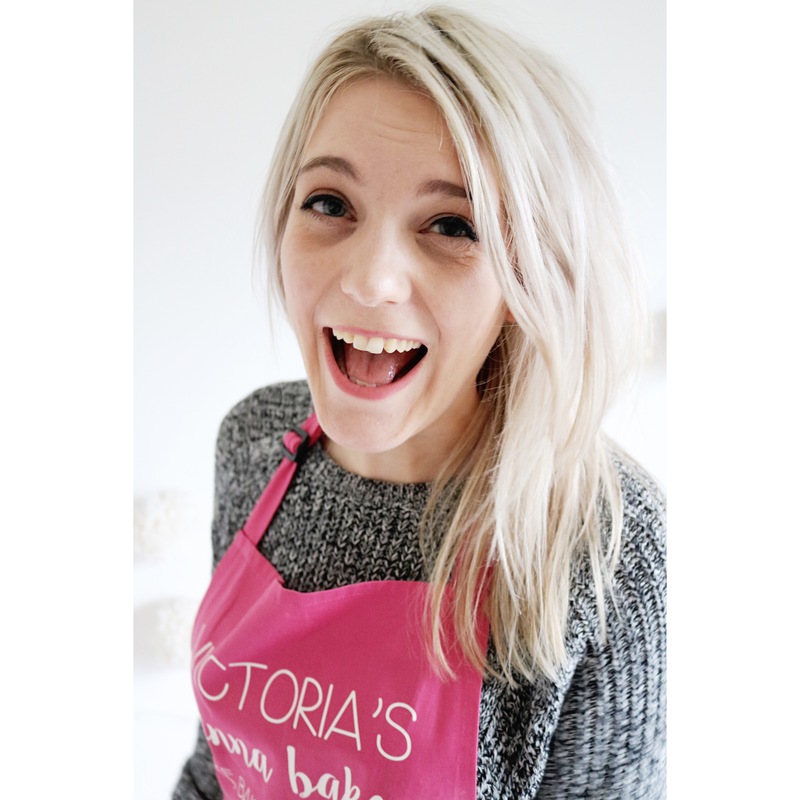 In a bowl whisk together the icing sugar, 1 tsp of gin and enough water to create a thick icing roughly the consistency of toothpaste. Place a narrow piping nozzle in a disposable piping bag and cut the bag around half a centimetre from the tip then spoon in the icing. For the splattered stars, pipe an outline around the edge of each star and leave to air dry for about five minutes. For the snowflakes, pipe a simple linear design with some dots for decoration, leaving to air dry. You should have enough icing to do 12 snowflakes and 12 stars. Snip the tip off the icing bag and squeeze the remaining icing back into the bowl, adding more water a tablespoon at a time until it is still viscous but runny. 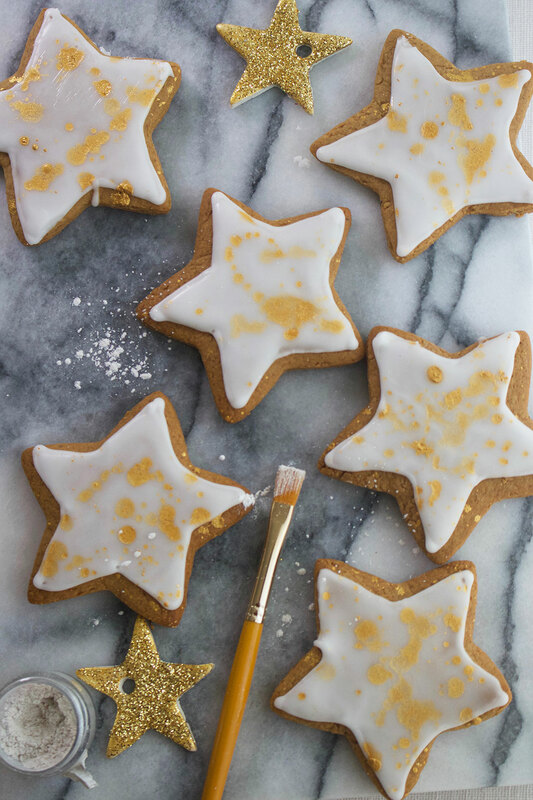 To flood the star biscuits, spoon icing a teaspoon at a time into the middle of each star and using the back of the spoon or a skewer, tease the icing into to corners to create a neat shape. Leave to dry completely. 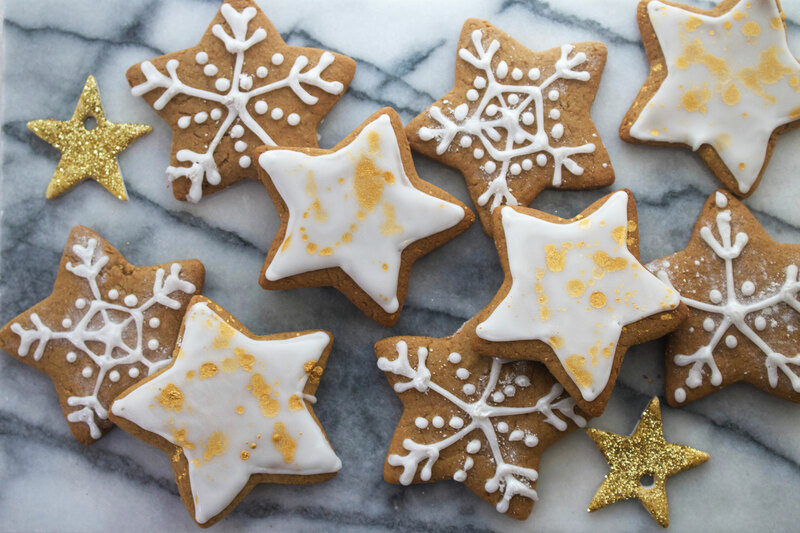 To decorate, use a clean paintbrush to dust the icing snowflake shapes with the pearlised edible powder to create a sheen. 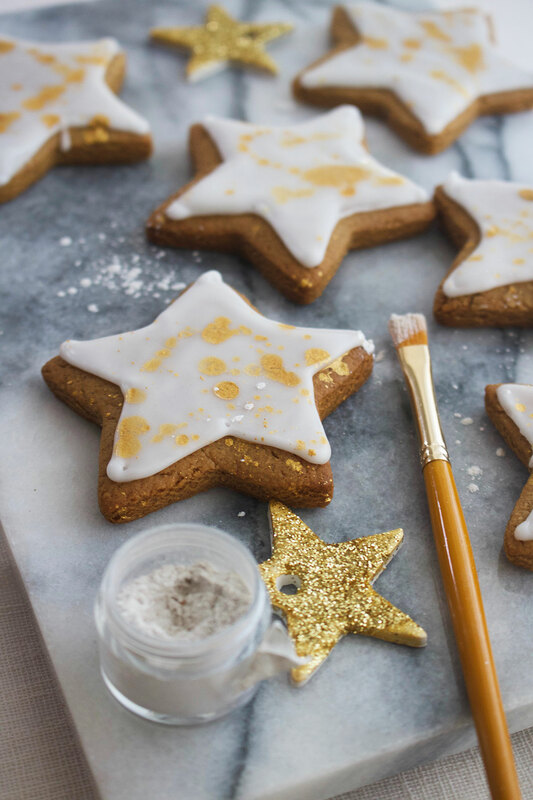 For the splattered stars, mix ½ tsp gold edible glitter with a few drops of gin and a little lemon juice until well mixed together, then load up the brush and flick it firmly downwards over the iced biscuits to create irregular splatters. Leave to air dry then transfer the biscuits to an airtight box where they will keep for five days. Darnley’s Gin sent me some of their products to try, however this is not a sponsored post. All opinions are my own. Yum!! 🙂 This look beautifully done too! These are beautiful! I love throwing in some new cookie recipes with the usual ones I make every year. I’ll have to give these a try!